How Does Being Overweight Affect Sleep Problem Risks? How Does Being Overweight or Obese Affect Your Risk of Sleep Problems? It is easy to recognize that being overweight or obese can have negative health consequences, but how does being overweight affect your sleep and the risk of sleep problems? You may be surprised to learn the unexpected ways—from snoring and sleep apnea to restless legs syndrome—that your ability to rest may be compromised. Learn about the links between weight and sleep and how poor sleep may, in turn, lead to weight gain. As Americans and people throughout the world consume more calories and engage in less physical activity, the number of people who are overweight and obese continues to grow. This jeopardizes health in obvious ways, resulting in more heart disease, diabetes, and stroke. It also may have surprising consequences that may correlate with the degree of obesity. It is not perfect, however, and may overestimate body fat in athletes or underestimate body fat in older people who have lost muscle mass. You can calculate your BMI using an online calculator. In a general sense, the amount of excess body fat you have may correlate with your degree of risk for developing health problems from being overweight, including those related to your sleep. A few extra pounds above your ideal body weight may have a negligible effect on your sleep. However, the more pounds you pack on, the greater the effects may be. If you are obese, you are at the highest risk for various complications. In the world of sleep, the most recognized complication from being overweight or obese is disrupted breathing that leads to snoring and sleep apnea. The excessive fat that is present acts to insulate and pad your body. It is easy to recognize it when it leads to a large stomach, a fuller face, enhanced hips, or more prominent buttocks. However, it also hides in places that we cannot directly see, including along our airway and at the base of the tongue. This crowding, combined with added weight pressing from the outside such as increased neck size or the stomach reducing lung volumes, collapses the airway and causes problems. When this is mild, it leads to snoring. Snoring is simply turbulent airflow. Imagine your breath as a river. When the river's channel runs deep, there is hardly a ripple in the surface. Similarly, a clear airway makes no noise. However, when the flow is obstructed, turmoil results. In the river, rapids and whitewater break and disrupt the surface. In your airway, the disrupted airflow becomes noisy and results in snoring. This may be more likely if you have obstructions along the pathway like enlarged tonsils or adenoids, a deviated septum in the nose, a small lower jaw (called retrognathia), or a large tongue (called macroglossia). Children are particularly susceptible to having problems from enlarged tonsils. As the airway becomes more crowded and more prone to collapse, the flow of air can completely cease. This will result in pauses in breathing called apnea. This comes from a Greek word that means "without breath." When it is of less intensity, a partial obstruction may occur and this is called a hypopnea. People who undergo a sleep test to analyze their nighttime breathing may have these events summarized as the apnea-hypopnea index (AHI). The problems associated with sleep apnea are well-established. There are nuisance symptoms like excessive daytime sleepiness and problems with concentration, memory, and mood. There are also more serious effects. It may independently increase your risk of heart failure, hypertension, and diabetes. Sleep apnea correlates with a higher risk of stroke and sudden death. Children face their own consequences, including effects on growth and development. In the most severe cases, difficulties breathing at night may lead to problems retaining carbon dioxide well into the day. Carbon dioxide is normally blown off when we breathe adequately. In some obese people, this becomes so compromised during sleep that it becomes impossible to catch up during wakefulness. This is known as obesity hypoventilation syndrome. It increases the risk of major cardiovascular complications as well as death. Beyond difficulties breathing, weight may have other impacts on sleep. Restless legs syndrome is characterized by a discomfort in the legs in the evenings with an urge to move to relieve the symptom. There are many potential causes of restless legs syndrome, from iron deficiency to pregnancy. One of the curious causes that has been associated with an increased risk of restless legs is obesity. Some research suggests that a chemical messenger in the brain called dopamine may be involved. It is not fully understood what might explain this relationship, however. It has also been observed that people with restless legs syndrome often get up and grab a bite to eat during the early part of the night. This seems to provide some relief from the symptoms affecting their legs. Whether these extra calories contribute to obesity and the existence of this relationship is uncertain. Finally, there seems to be a converse relationship between sleep and obesity. Not only can being overweight or obese negatively affect your sleep through sleep apnea and restless legs syndrome, but certain sleep problems may contribute to obesity. 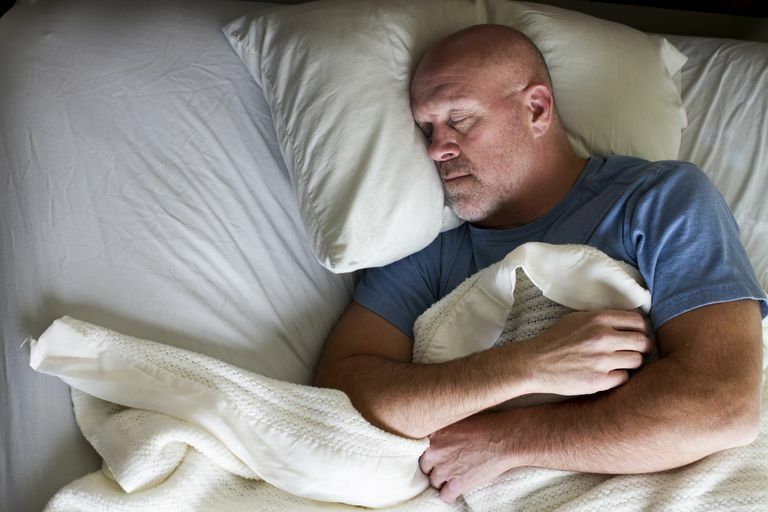 Abnormal sleep behaviors, or parasomnias, may rarely have a role. One such condition is called sleep-related eating disorder (SRED). In this disorder, the affected person repeatedly and involuntarily eats during sleep. The foods consumed may be unusual, dense in calories, or even inedible (such as coffee grounds or kitty litter). Most people who are affected with SRED typically become aware of their affliction by discovering missing food or a messy kitchen in the morning—not to mention the bedeviling fact that they just can’t seem to lose weight. A far more common contribution to gaining weight may be something that we likely all experience: sleep deprivation. Research suggests that inadequate sleep may lead to hormonal changes that disrupt metabolism. How our body regulates the use and storage of fat may be compromised. Moreover, disrupted sleep may lead to insulin resistance and an increased risk for diabetes. Therefore, not getting enough hours of sleep to meet the required sleep needs, or getting sleep of poor quality, may worsen weight gain. In summary, there are clear relationships between being overweight and obese and difficulties in sleep. The most common resulting condition may be sleep apnea with a variety of important consequences. There may even be an increased risk of unexpected disorders, such as restless legs syndrome. As a general rule, losing 10 percent of your body's weight may reduce some of these effects. Moreover, there also seems to be a converse association between disrupted sleep and the risk for obesity, especially the common occurrence of sleep deprivation. This complex relationship deserves your attention as the effects of poor sleep and obesity together can undermine your health. Collop, N. "The effect of obstructive sleep apnea on chronic medical disorders." Cleveland Clinic Journal of Medicine 2007; 74:1. Gao, X et al. "Obesity and restless legs syndrome in men and women." Neurology 2009; 72:14:1255-1261. Taheri, S. "Sleep and metabolism: Bringing pieces of the jigsaw together." Sleep Medicine Reviews 2007; 11:159-162. Yaggi, HK et al. "Obstructive sleep apnea as a risk factor for stroke and death." N Engl J Med 2005; 353:2034-2041. Is Falling Asleep Too Fast a Sign of a Sleep Problem?